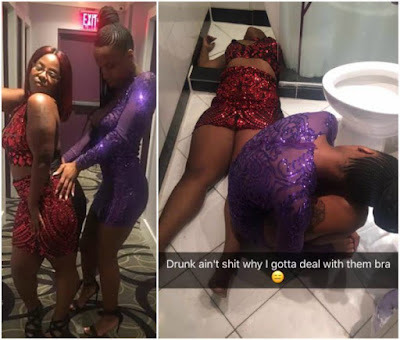 These photos of two ladies who got drunk after partying has gone viral and they have been made a laughing stock online. The photo which seem to have been shared by a friend of theirs shows a picture of them having fun as they are about to step out and an aftermath photo which showed them drunk and wasted on the ground. They both ended up in the toilet after the whole groove. 0 Response to "Viral photos of two ladies who ended up in toilet after partying"